Here’s what people need to remember about the attacks in Paris on Friday the 13th of November 2015. According to most media reports the shooters at the Bataclan opened fire upon entering the concert hall, they opened fire on the main level of the hall (where the concert was) but there are a few accounts that speak of shooters firing on the crowd from the balcony and it are these accounts that need to be investigated further because if the main suspects entered from the backside of the concert hall only then this means that we are dealing with other shooters who have so far been “forgotten” by the press and the French government. Yet, another “witness” claims that the shooters entered the hall through the entrance under the balcony, where she was standing, so she couldn’t see the shooters. Along with 50 other persons she was able to escape through a window on the balcony- level of the Bataclan. Were these shooters at the balcony part of the initial group of shooters or were they a separate group of operatives? What happened to these shooters on the balcony? So far there’s not a single mentioning of them in the press, aside from these few witness accounts. Also at the “Batman shooting ” in the US, there were multiple shooters. Yet only one patsy has been focused on by the press and government officials and we know his future. Are we dealing with a similar situation here too, in Paris? 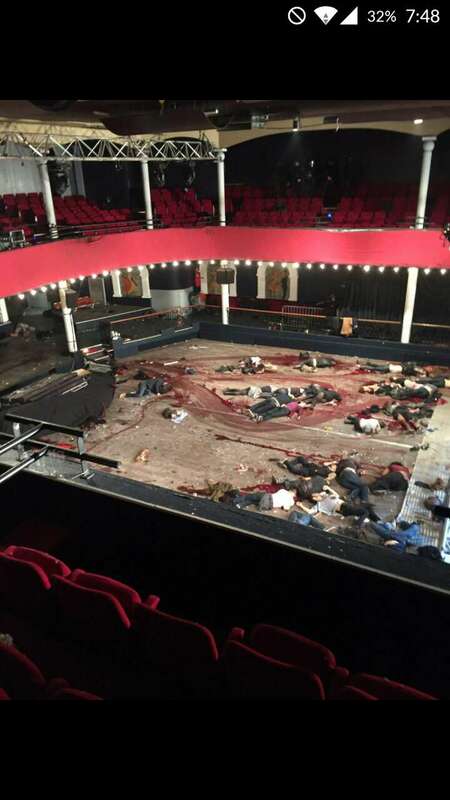 Obviously someone other than the alleged shooters have been dragging bodies around in the Bataclan concert hall. One may honestly wonder why that is, if not for a dedicated photo shoot! Either way the crime scene has been tampered with, deliberately, all the while no medical units are attending any of the dead bodies. “As the site of annual fundraisers for the IDF,” the Bataclan concert hall was jewish owned allegedly until September 11, 2015, when the jewish owners sold the complex after being a family business for 40 years. There were emergency exercises planned and going on on the same day of the actual attacks and these exercises included multi-site events practically identical to what has unfolded in Paris, on cue. The heads of intel of the USA, France and Israel discussed these “spontaneous” events a mere two weeks prior to the attacks. All the alleged suspects are dead, leaving no necessity for any trials that would reveal who ordered the attacks. Hundreds of people were present during the “attacks” yet no one has made available any photos or videos that adequately document the shootings and bombings. The fact that ISIS allegedly has claimed the attacks clearly shows that the UNEI (US, NATO, EU, Israel) terror apparatus was and is well aware of who is behind the attacks since ISIS is an UNEI invention with one of its main headquarters in Amman, Jordan, where the CIA and the Mossad daily meet and further plan the shipping of cool Toyotas and of rocket launchers made in the USA – after they have reviewed Rita Katz her next set of fake ISIS beheading videos, while still laughing their asses off for successfully fooling the world with the fake narrative about the Delta Force raid on Abu Sayyaf in Syria THAT NEVER HAPPENED.